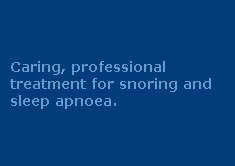 Surgical treatments for snoring and apnoea / apnea. If your airway obstruction is caused by a structural problem in the nose, surgical procedures can be used to straighten the septum (middle part of the nose, separating the nostrils). Nasal surgery is usually only mildly uncomfortable. The main difficulty is blockage of the nasal airway for the first week after surgery and the dry mouth that results from this. Most discomfort is readily handled by simple pain medications such as Paracetamol (Panadol). Nasal surgery will cost approximately A$2500.00 including anaesthetic and hospital or day surgery charges. Rebates are available through most private health funds. The tonsils and adenoids are masses of lymphoid tissue located in the mouth and behind the nasal passages, respectively. As well as causing snoring and apnoea, infected or enlarged tonsils or adenoids may cause chronic or recurrent sore throat, bad breath and dental malocclusion (incorrect alignment of the teeth). If your snoring or apnoea is as a result of enlarged tonsils or adenoids, these tissues can be removed by surgery. This treatment is conducted under general anaesthetic, normally using a mix of gas and intravenous medications. al incisions and consequently no visible scars. The remaining portion of the tonsils and/or adenoids will usually be cauterised (burned) with an electrical cauterising unit. The whole procedure usually takes less than 60 minutes. You may be able to go home the same day as the surgery, once you have fully recovered from the anaesthetic. The most important thing you should do after a tonsillectomy is to prevent bleeding and dehydration by drinking plenty of fluids. This must be done despite the fact that, at times, it may be very difficult to swallow. Pain is common after a tonsillectomy, though the degree of pain varies significantly from one individual to another. Immediately after surgery, many patients report only minimal pain. The next day the pain may increase and remain significant for several days. Sometimes patients will appear to relapse a week after surgery when their pain becomes significant again. They usually report pain in the ears, especially when they swallow. This pain is usually the last type of pain experienced. Most patients will have recovered fully by two weeks after surgery. Occasional throat tenderness will be experienced for up to 6 weeks after the operation. Most patients require at least 7-10 days off work. Exercise can usually be resumed after three weeks. Voice Change: In rare circumstances, a permanent change can occur in the patient’s voice or ability to nasally regurgitate. Uvulopalatopharyngoplasty is a procedure where a surgeon trims and tightens flabby tissues in the throat and palate, thus enlarging the upper airway. The procedure is performed under general anaesthesia and usually requires a hospital stay for at least one or two nights. Post-operative pain is usually severe. “At the outset it should be emphasised that neither UPPP or laser palatoplasty have any role whatsoever in the treatment of sleep problems from snoring. Laser Assisted Uvula Palatoplasty is a relatively new treatment used to treat snoring and mild obstructive sleep apnoea. A small, hand-held laser is used to make vertical incisions in specified portions of the uvula and of the soft palate. These incision are made over the course of a series of small procedures. The procedures are normally performed in a doctor's office under local anaesthesia. Depending on the severity of your snoring, you may need more than one session – some people may need up to five or six sessions before their snoring is improved. If you need multiple treatments, they will likely be spaced four to six weeks apart. In general, this surgery does not have serious side effects – although it must be noted that, in a very few cases, laser surgery can raise or lower the pitch of the voice. In most cases you can continue your regular activities immediately after the procedure. Some people may have a sore throat for about one week after each treatment. Palatal surgery usually costs between A$2,000-3,000 including surgery, anaesthetic and hospital or day surgery charges. Note that this form of treatment is only effective when an excessively sized or floppy soft palate and/or uvula is the cause of the snoring or related SDB. In most cases, the tongue is the primary cause of the constricted airway, and so reduction or stiffening of the soft palate is unlikely to be effective in these cases. This treatment is usually a relatively simple procedure, although an overnight hospital-based sleep study will usually be required. The treatment uses a needle electrode to emit targeted radio waves to heat and shrink tissue in the upper palate, uvula, base of the tongue and nasal turbinates (bony structures in the nose). Your mouth and throat are numbed with topical and local anaesthetic. Radio frequency energy is then delivered beneath the surface layer of the soft palate, causing scar tissue to form. The procedure usually takes less than fifteen minutes. There may be some swelling and discomfort or pain for a few days following the procedure, but the treatment usually creates little pain and most patients enjoy a rapid recovery. Reduction in snoring usually occurs two to eight weeks after the procedure – although snoring can be expected to be worse immediately after the procedure due to swelling of the tissues. A subsequent procedure may be needed after two months following the initial treatment for further resolution of the problem. Any post-operative discomfort is usually relieved with acetaminophen, ibuprofen or aspirin, but stronger medications are occasionally required. Somnoplasty usually costs around $3,500. This includes a second and third treatment should they be necessary. The Pillar Palatal Implant System involves the insertion of one-inch long polyester cords into the soft palate. Once the inserts are in place, this material promotes fibrosis and tissue ingrowth, which stiffens the palate tissue and thereby reduces its tendency to vibrate noisily during sleep. The inserts are specifically designed to be removable. If the implants fail to achieve the desired result they can be removed through another surgical procedure, thereby providing the patient with the flexibility to pursue other treatment options. The Pillar system is generally provided in a physician’s procedure room setting under a local anaesthetic. This procedure is likely to be effective only in patients whose condition is caused by a vibrating soft palate. If other factors exist, such as nasal blockage, enlarged tongue or enlarged tonsils, the treatment is unlikely to be fully effective. It is claimed that suitable patients see results in two to four weeks after treatment. Multiple office visits are not required and it is claimed that the system causes only minimal discomfort. No scientific study data could be found in relation to this treatment. The Pillar procedure costs approximately $2,800. No rebate is available from medical insurance at this time. Injection snoreplasty involves the injection of a hardening agent into the upper palate. The procedure was first introduced at the 2000 Annual Meeting of the American Academy of Otolaryngology – Head and Neck Surgery Foundation. The Academy neither endorses nor discourages the use of injection snoreplasty. Injection snoreplasty is performed on an outpatient basis under local anaesthesia. After numbing the upper palate with topical anaesthetic, a hardening agent is injected just under the skin on the top of the mouth in front of the uvula, creating a small blister. Within a couple of days the blister hardens, forms scar tissue, and pulls the floppy uvula forward to eliminate or reduce any palatal flutter that is contributing to the snoring. In some patients, the treatment needs to be repeated. This form of treatment is obviously only indicated for patients who snore because of an enlarged uvula. If a floppy soft palate, enlarged tongue, or floppy pharyngeal walls are the cause of the snoring / apnoea / apnea (as is usually the case), then the injection snoreplasty treatment is unlikely to be effective. Tylenolâ and throat lozenges or spray are suggested for pain management. Patients can usually return to work the next day. Though snoring may continue for a few days, it should eventually lessen. Side effects include a residual sore throat and/or a feeling that something is “stuck” in the back of the mouth. Most surgical procedures cannot be reversed, or cannot be reversed easily. Reversal, if possible, will require further surgery with its attendant risks, discomfort/pain and expense. “As a surgeon my main area of involvement is developing better surgical treatments for apnea,” Dr. Woodson said. "The problem is that any given surgery may or may not make the airway big enough and stiff enough. The success rates for any given surgery are less than what we’d like to see." This is not to suggest that surgery should not be considered as a viable treatment. It can be and in some cases, as mentioned earlier, it will be absolutely necessary. But as a general rule, it is logical and appropriate that surgical treatments for snoring and apnoea / apnea should be considered a ‘last resort’ option. For information on how the non-surgical treatments for snoring and apnoea / apnea provided by The Sleep Therapy Clinics can help, call 1300 246 637 or click here.